No, really, it was "Barbie Day". Well, sort of, anyhow. The Dallas Zoo was hosting a sneak preview of the new Barbie movie "Barbie the Island Princess." 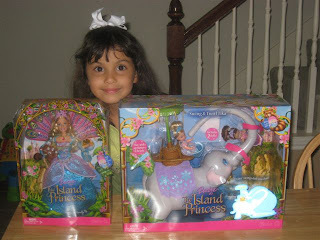 The tickets were free and the kids could meet Barbie & have their picture taken with her, then see an early preview of the movie and get a goodie bag. Plus, it was $2 admittance day at the zoo, so why not, right? We opted to drive instead of taking the DART, so we got down there with some time to spare. Since it was hotter than Hades, we met Barbie, then decided to find seats inside for the movie (it was air-conditioned). We got one more picture with Barbie indoors with both kids before the movie started. Now the cool thing was, each kid got a raffle ticket when we went inside. They had a table showing all the new Barbie merchandise for this movie and that was what they gave away for the raffle. 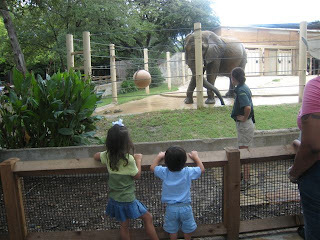 Faith's ticket was drawn and she got Tika the elephant with the 2 little princesses. Then a couple of turns later, Ben's ticket was drawn and he (well Faith really) got Barbie as Princess Rosella with her pet red panda. So Faithie got two pretty cool toys out of the deal. She was kind enough to let Ben think the elephant was his so I didn't have to listen to him carry on about elephants. After Barbie, we saw real elephants, Ben was so happy. Then we wandered the zoo for a bit and saw anteaters, giraffes, warthogs, some monkeys, a sleeping lion, etc. 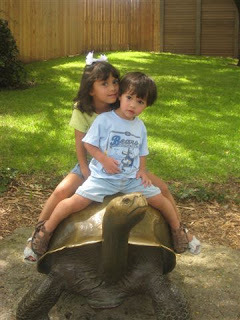 We stopped for another cute picture on a giant turtle statue (not quite as cool as my tradional komodo dragon statue picture at the FW Zoo but cute nonetheless). When we got home, Ben went for a nap and I convinced Faith to let me take a picture of her with her goodies for her scrapbook. Immediately afterwards, she insisted on opening the goodies and spent the next 2 hours playing Barbie. I need to add some of this stuff to her birthday list, especially since Uncle Scott asked for ideas. So all in all, a worthwhile outing. And if you want to be really technical, it cost me $4 in admission (Ben was free) and $5 to park. 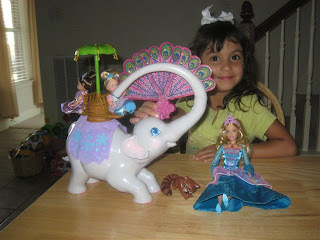 The elephant toy retails for $30 and the Barbie for $20, so I came out well ahead. LOL.